Hosannah: " Michael Phelps" Inspires Me!!
" 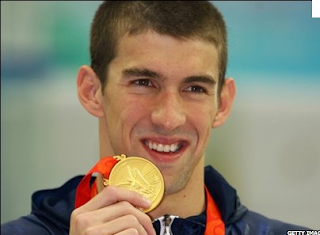 Michael Phelps" Inspires Me!! Michael Phelps! He is a well-known swimmer and one of the world’s fastest. Also, he is a vibrant man that is the most accomplished American swimmer of all time!! On an article I read, is said that he is a professional swimmer that was born in June 30th 1985 in Baltimore, America. Overall, he won 16 Olympic medals, six gold and two bronze at Athens in 2004, and eight gold at Beijing in 2008. Phelps, (From above) holds the record for the most gold medals won in a single Olympics and his medal total is second only to gymnast Larissa Latynina. His full name is actually “Michael Fred Phelps.” His mother and father's name are Fred and Debbie Phelps. The youngest of three children, Michael and his sisters grew up in the neighbourhood of Rodgers Forge. Phelps began swimming when his two older sisters, Whitney (born 1978) and Hilary (born 1980), joined a local swim team. Isn’t this a cool story. I just found my favourite swimmer and he is an enthusiastic man. He inspires me because he is too famous that I just want to be as popular as him. ( I was just joking:) Also, I want to be like him because I want to win the same amount of gold medals he won. By the way, "GOLD FOR GOLD!!" Thanks to Vanila for reading and checking my work. I mean it, "Thank You."